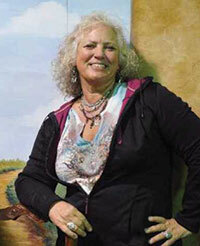 With over ten years in the decorative finishing field, Barb is well known for her extensive finishing skills in and around Evansville, Indiana, where her company, Just Faux It (est. 2006), is located. 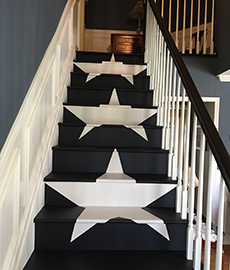 On a recent project, her client requested numerous of dramatic finishes with “wow-factor.” Barb put her creative thinking cap on, and with tools and skill in hand…that’s exactly what he got! 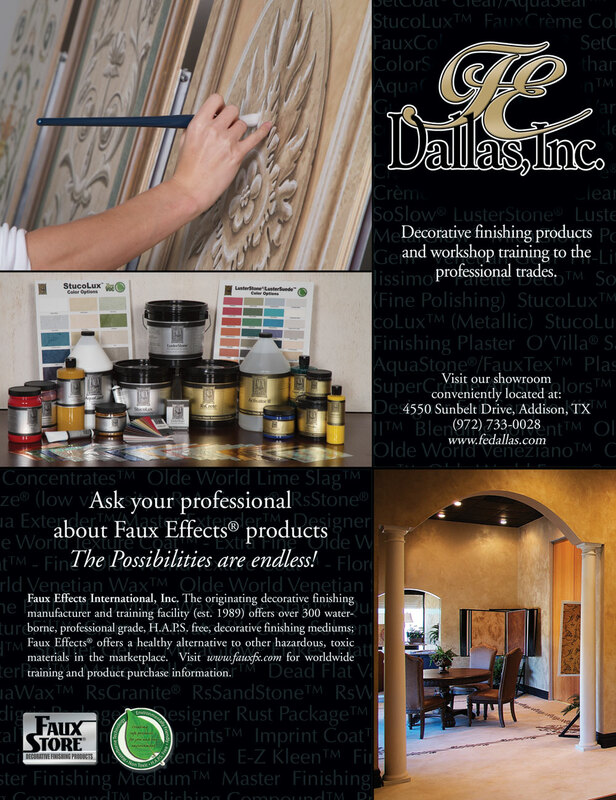 His contemporary home was treated to a variety of exclusive finishes created by Barb and her team who were taught at Faux Effects® licensed studios throughout the years. In the owner’s home office, a popular restoration-type designer finish was mimicked to create an aerodynamic metal look. 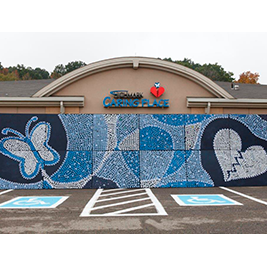 Moonglow Silver LusterStone® was darkened and was applied over a SetCoat® base in random T shapes, left and right and up and down. 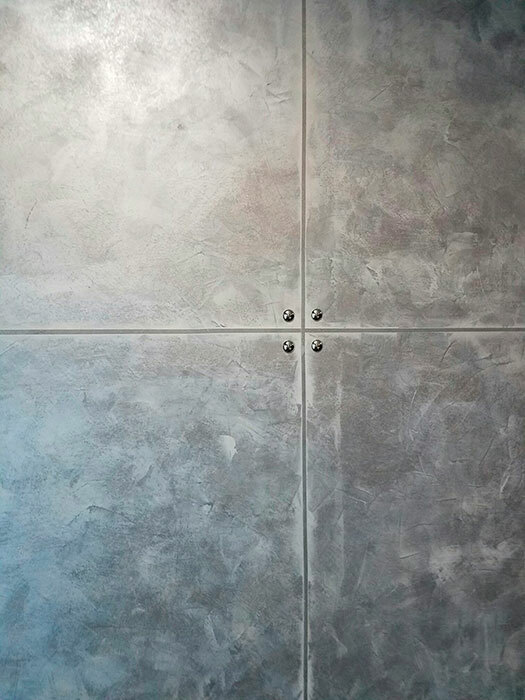 Then, a grid was taped off to mimic sheets of hammered steel. Moonglow Silver LusterStone® was then skimmed on very tightly so that both colors would show through. After pulling the tape to show the “weld lines,” nail heads were added for an authentic look. 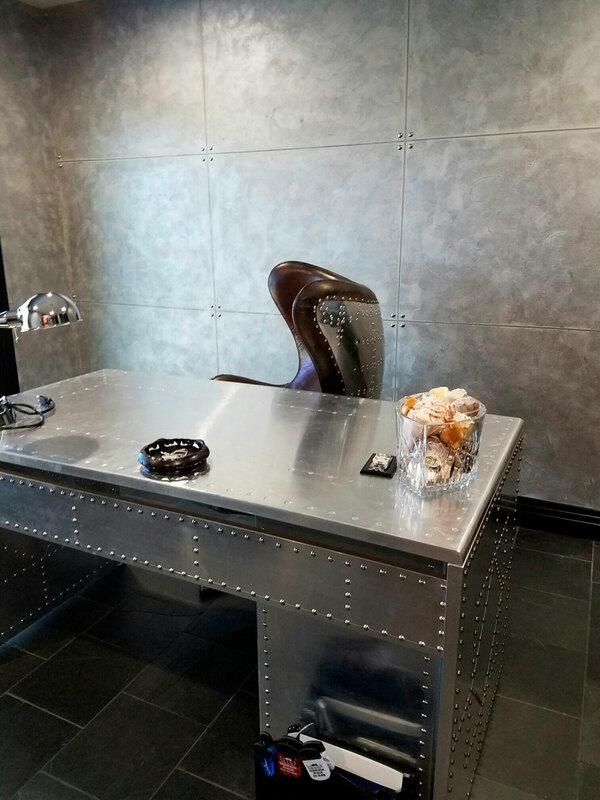 Adding a matching silver metallic riveted desk with leather and silver metal accented office chair pulled together the restoration theme…straight out of an interior design resource book! 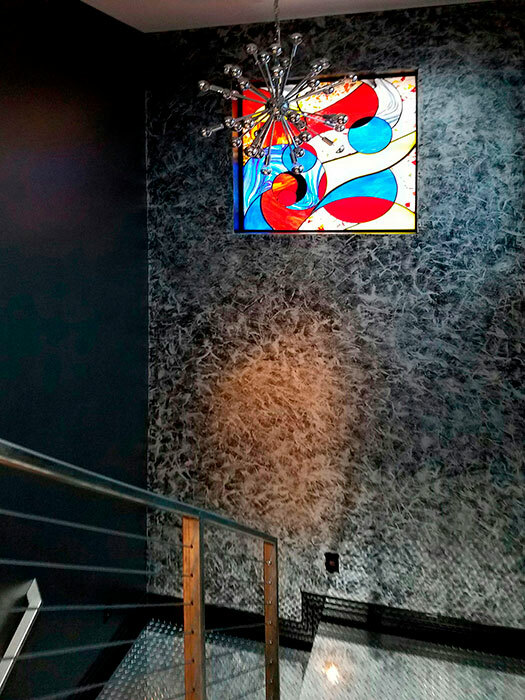 When addressing the main staircase of the home, to compliment the industrial metal treading and metal wired handrails, Barb quickly envisioned dramatic black plaster walls to showcase the vibrant, modern stained glass window and contemporary orb-like chandelier. 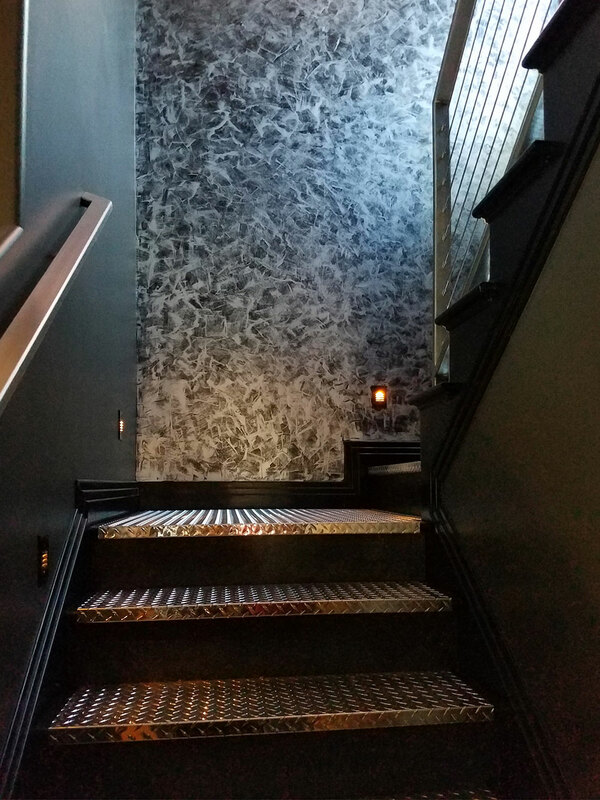 The Just Faux It team heavily applied Black Onyx Venetian Gem® to create this striking thick and thin textured finish. 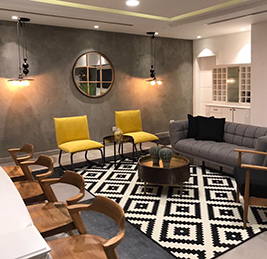 To enhance the finish’s movement, a Town Silver MetalGlow® glaze was applied in a tight skim creating the perfect accent on the main landing. Barb loves a dramatic ceiling and believes the fifth wall should never be forgotten. In the dining room, she started by painting with Leo Gold MetalGlow® followed with large mica pieces hand applied and glued into place in the ceiling dome. 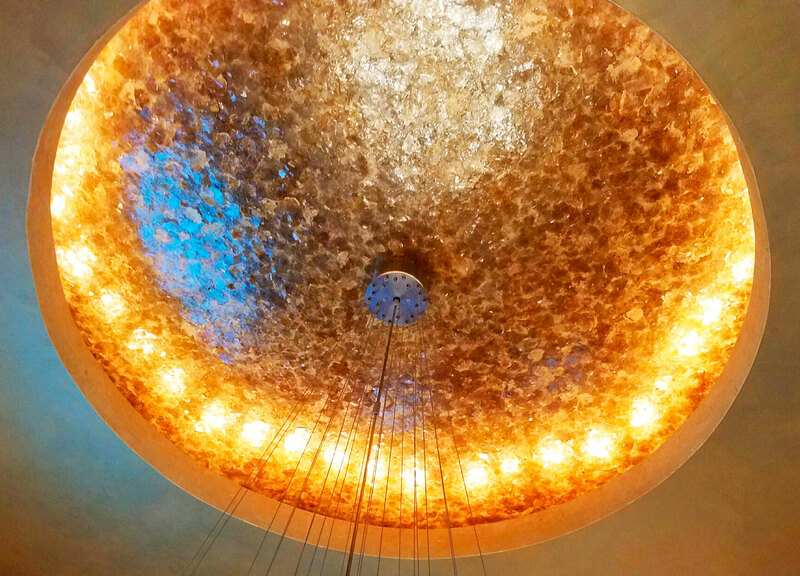 With the minimalistic but bright chandelier, the sparkle and twinkles of light reflecting off the gold and mica dance from floor to ceiling! 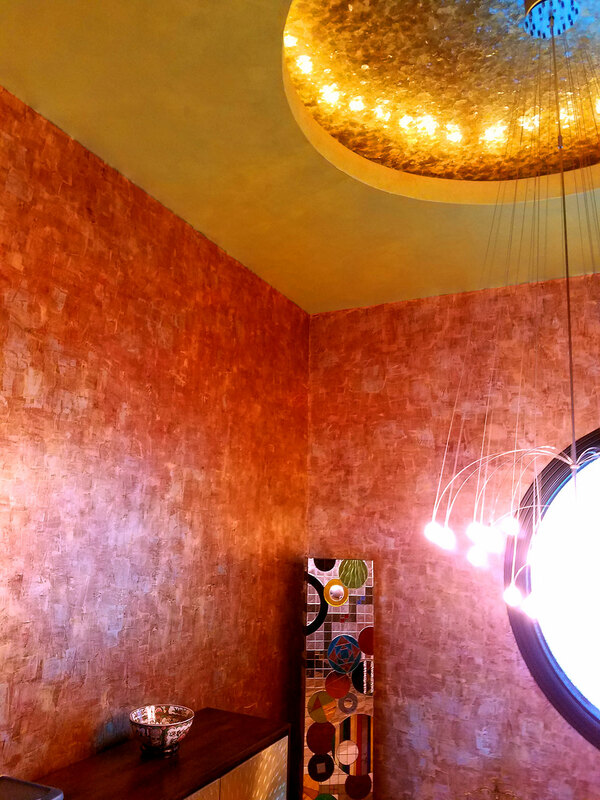 The room’s walls were created to flatter the fifth wall. 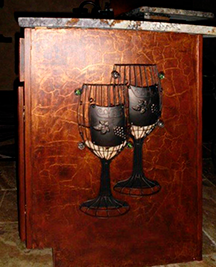 Just Faux It created a customized finish with a multi-color technique using Palette Deco™ in Gold, Silver and a custom red tint all over Copper Palette Deco™ as the base. 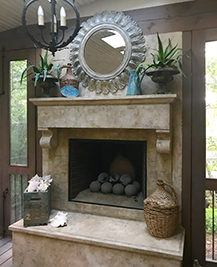 To complete the finish, a tight skim over the top with a Van Dyke Brown FauxCreme® tinted glaze gives it an old, worn yet cohesive look. 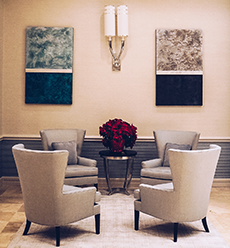 A perfect complement to modern furnishing and artwork! 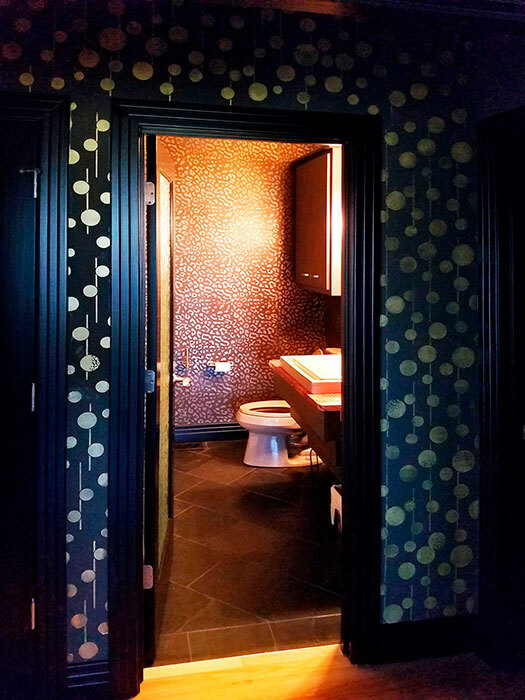 The powder room needed eye-catching attention, which was easily achieved with a cheetah animal print finish! 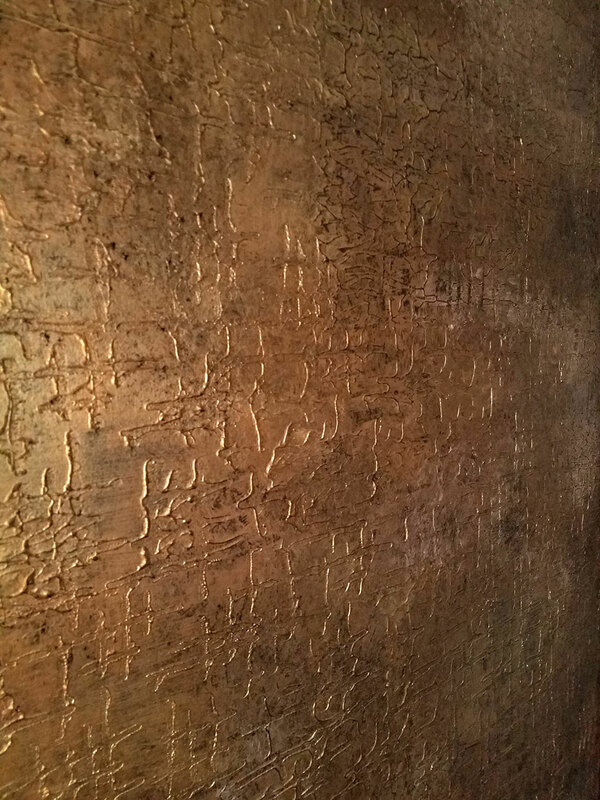 Barb applied a Cheetah print stencil over Brown SetCoat®, with a mix of MetalGlow® in silver and gold tones through the stencil for a champagne effect. 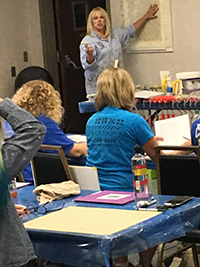 She pursued on to add more effect than just the stencil work by adding Van Dyke Brown FauxCreme Color™ dry brushed over the top, letting the brush strokes show to give it a realistic fur look. To double the eye catching attention, the hallway leading to the powder room, was enhanced with Caterpillar Gold MetalGlow® applied through the Bubble stencil over a Dark Brown SetCoat® base. Such dramatic results! For more metallic drama, she treated the living room was to a rolled on Black Onyx Venetian Gem® finish. 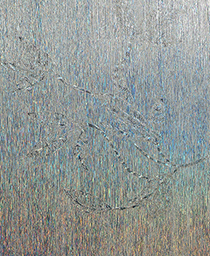 While still wet, an embossing tool was rolled through it creating a pattern. 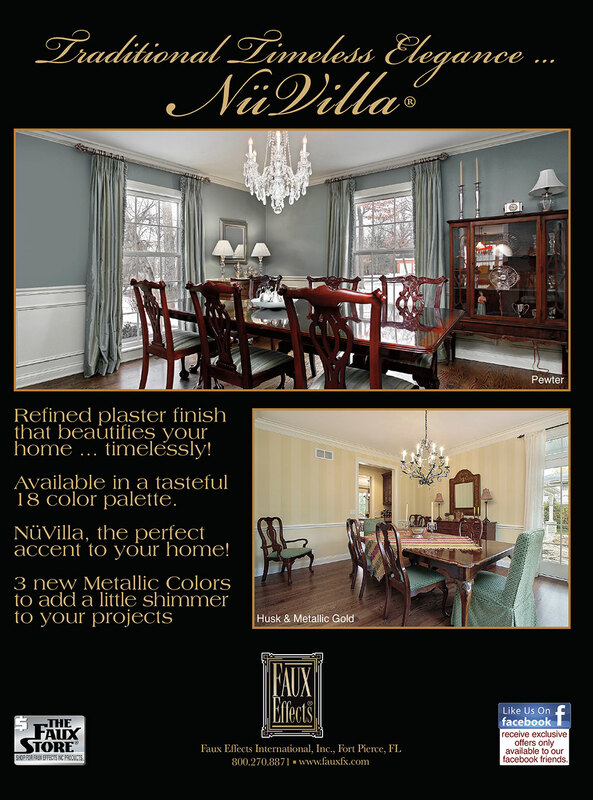 Once dry, custom mixed metallic FauxCreme® glazes were applied to create depth and texture. 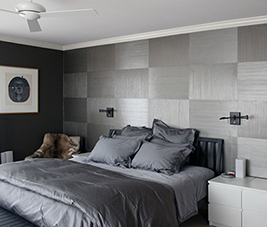 The final “wow-factor” challenge in the home was the master bedroom. 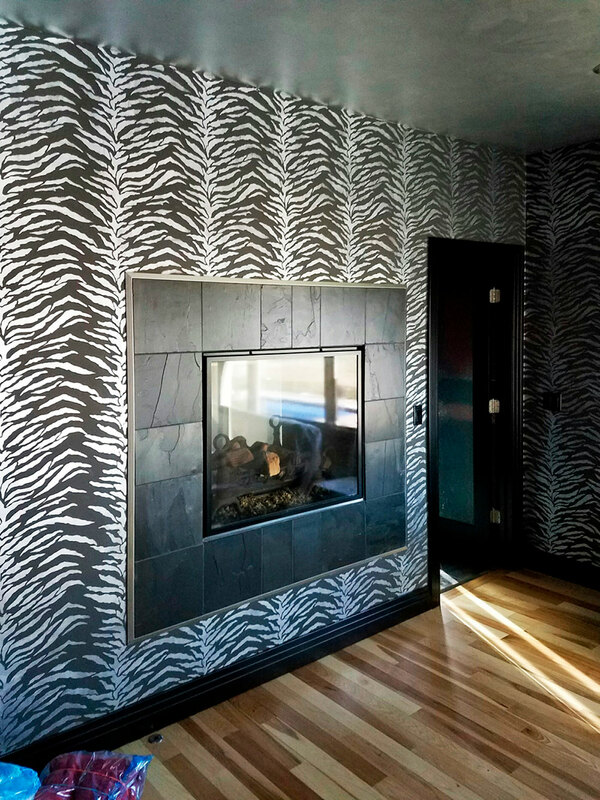 Barb wanted to really make the walls “pop” around the modern gas fireplace. Again using metallics to enhance the dancing fire flames, a Zebra stencil was used with Town Silver MetalGlow® both through the stencil and onto the ceiling. 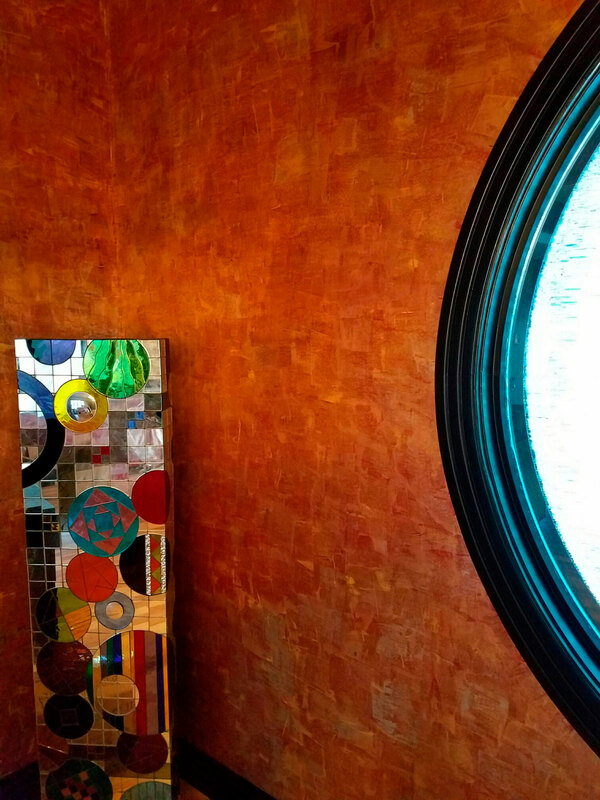 To complement the silver and gray finish, custom mixed red Venetian Gem® was applied to the walls in the master closet, textured with an embossing roller, and toned with a Black FauxCreme® glaze.